The farther you get from Budapest, the closer you get to history and traditional culture, from a circa 1100 church to farms tended by hand to a Merry Cemetery. Romania is full of surprises and wonderful people. And as you leave the capital of Bucharest, it gets even better. In the countryside, the history and traditional culture survive vividly. A hard-fought past is evident in the fortresslike churches scattered through the Transylvania region in central Romania. In medieval times, big towns were well-protected, but smaller villages were vulnerable to invaders, so industrious German settlers, imported by the local overlords to tame the wild frontier, fortified their churches. Like medieval fortresses, these Saxon churches have beefy bastions, stout lookout towers, and narrow slits for raining arrows on enemies. Entire communities could take refuge inside — within wraparound defensive galleries. Today most of Romania’s ethnic Germans are gone, having emigrated in the late 19th century or fled to Germany after World War II. But their legacy lives on. Stepping inside these churches feels like stepping into medieval Germany. Decoration is humble, pews are simple benches, and Bible quotes are in German. The whitewashed and ramshackle church of Viscri, hidden deep in the hills, is one of the oldest (c. 1100). Most of the pews don’t have backs. That’s because of the starched dresses and long headdresses of traditional village women, who wanted to avoid creases in their best clothing. The pews with backs were for the families of those who were from elsewhere, usually the minister and the teacher. Farther north, Romania’s Maramures region is Europe’s most traditional corner. While it takes some effort to reach, Maramures is well worth the effort for those who want to see a real, living open-air folk museum. It’s a rolling, pastoral landscape speckled with haystacks. 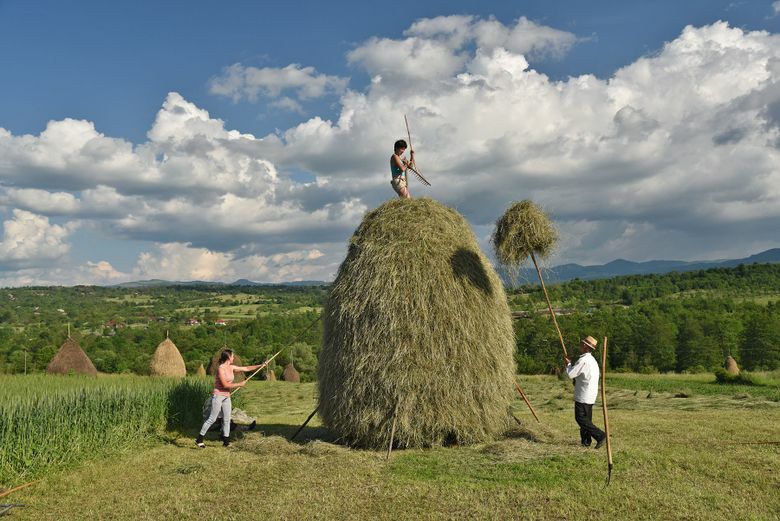 Thanks to its rugged terrain and its great distance from Bucharest, Maramures avoided communist farm collectivization — so people still tend their small family plots by hand. Horse carts seem to outnumber cows. Men in overalls and distinctive straw hats pile hay onto their wooden wagons. Women wear big, puffy skirts just above the knee, babushkas on their heads, and baskets laden with heavy goods on their backs. This region feels like Europe’s Amish Country, where centuries-old ways endure. It’s not for the benefit of tourists — it’s just their lifestyle. Wander through any village and peek into family compounds. Each one is marked with a huge, ceremonial wooden gateway — just big enough for a hay-loaded horse cart to trot through. The gates are carved with a whole iconography of local symbols: starburst (pagan sun worship), wolf teeth (protection), bull horns (masculinity), leaves (nature), and — most importantly — the “rope of life” motif, a helixlike design suggesting the continuity of life from generation to generation. Inside each courtyard, you’ll usually see — in addition to the main house — a humble barn with a paddock, a garden patch, and an old-fashioned, hand-pulled well. You’ll be surprised how often you’ll be invited inside. Many Maramures residents are eager to show curious visitors their humble homes. In Romania, meeting people often comes with a welcoming glass of the fruity, 100-proof Romanian moonshine called “palinca.” It’s strong stuff — kind of like rubbing alcohol with a touch of plum. One of the most memorable sights in this part of Romania is the Merry (as in “joyful”) Cemetery. I’ve enjoyed a variety of graveyards throughout Europe, but this one in Maramures is one of a kind. In 1935, a local woodcarver — inspired by a long-forgotten tradition — began filling this cemetery with a forest of vivid memorials. Each one comes with a whimsical poem and a painting of the departed doing something he or she loved. Although the cemetery is dubbed “merry,” many of the poems are downright morose. Tales of young lives cut short by tragic accidents, warriors mowed down in the prime of life, or people who simply never found happiness are a reminder that death, and life, are sometimes nothing to be cheerful about. Even if you can’t read the poems, the images speak volumes: weaver … loved bikes … television repairman … soldier … hit by a car … struck by lightning … nagging mother-in-law. It’s a poignant celebration of each individual’s life, a chronicle of village history, and an irreverent raspberry in the face of death. And it’s all painted a cheery blue to match the heavens where the souls are headed. Traveling in the Romanian countryside, you’ll find both evocative reminders of the past and time-warp lifestyles, seemingly oblivious to the modern world that’s the norm elsewhere. More than any place I’ve found in Europe, this is a place where, when you slow down and let adventures unfold, they will. In Romania, you’ll find that rather than famous sights, it’s the happy and unpredictable serendipity that leaves you with lifelong memories as souvenirs.